So lately I've been feeling a bit bored with straight-up vintage styles. My sewing pattern collection is almost purely from the 1940s and 50s, and over the past years, I've always tried to be conscious about using the proper fabric with the proper cut. Lately I find myself using contemporary fabrics (or the "wrong" fabrics) and blending design elements from one decade to the next. And this Halloween project was the perfect chance to have fun! A local merchant, Country Rose Shop, was hosting a Witches' Night Out last week. It involved spooky, late night shopping, in costume, while sipping hot cider and eating delicious, tiny cheesecakes. The shop was awash in the sights, sounds and smells of everything Autumn! But this meant that I needed a witch outfit. After a bit of time spent at Hobby Lobby, I walked out with this great novelty print and some inspiration from the Steampunk costume patterns. One problem with blending styles over the decades (or genres for that matter) is that you rarely have a pattern that meets your requirements. I was aiming for a Victorian-inspired jacket so I started with this vest pattern. 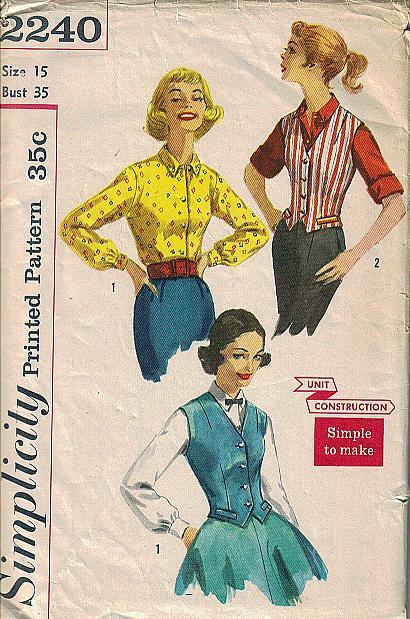 I added sleeves (from the coordinating blouse) and re-cut the neckline. I used my basic full skirt pattern to add tails onto the jacket. I lined the body so I wouldn't have to mess around with facings, but did minimal finishing on the inside because this is a Halloween costume afterall (and I was under a tight deadline). Paired with my gold satin skirt and a swank 1970s polyester blouse from the thrift store, I had a 1950s meets Victorian, glamour witch outfit. Even though it was the first time I had used the vest pattern, the fit was very good. I simply cut out the original pieces and sewed the front and back darts and shoulder seams. I basted the side seams and tried it on. In the mirror, I marked the cutting lines for the new neckline under the bust and took the shears to it. Unconventional perhaps, but it worked great! In the midst of sewing, my husband gave me some good ideas for using the lace trim, insisting that it should stand up at the back of the neck. Meanwhile my mother, who was visiting that week, raised her eyebrow at the new neckline. I laughed and said, "Wait til I wear this with my padded bra!" Again, Halloween costume, here. The idea is to have fun. I used the extra lace to roll up a rose for the hat. So here we are, dressed for the Witches' Night Out. My daughter is a witch in training, hence, no tall hat. She has her cat and broom ready, although she was really disappointed that the thrift stores didn't stock any black cats. My mother isn't big on costumes but at the last minute had a change of heart and pulled together an outfit from my daughter's dress-up box. She declared herself "Miss Kitty," the witch's familiar ala Red Hat. She giggled like that all night. We had a great time. With October only half over, I am trying to think of more places to wear this. If nothing turns up, I'll just have to go Trick or Treating with the kids! It was a fun project and has given me the itch to continue with this devil-may-care fashion sense. Okay, this outfit isn't that bizarre by any stretch of the imagination, but my everyday wardrobe may stray a little further from the period correct. I'm really wanting to do a burlap outfit for fall. Trimmed in plaid or Depression floral? I'll keep you posted on that one! That is too cute! It's very "Harry Potterish". You did a fantastic job! I was there too, but must've been later than you. Wasn't it fun?!! Your costume is so neat. Mine was more traditional with orange & black socks. I love your costume! Sounds like a great time. Love the photos! Absolutely darling costume! I love your sense of style...this is awesome, I'd wear it every chance i got! Very cute! I almost always ignore "period correct", because I'm adapting vintage for modern. Would it surprise you to know that for two Christmas dresses, I'm using eight patterns? It's Victorian-30s-40s-50s-60s-modern dresses. I'm calling them my "Psycho Billy Christmas dresses"! This is so freaking perfect, I can't stand it!! Happy Halloween! I love,love,love,this. I so wish I could sew like that. All of you look great! I love it, it looks so amazing, I hope you find more places to wear it! Dye that cat, honey! I'm inspired by your vintage print, made up with the freedom of Whatever Pattern I Would Like To Wear. You guys look great! LOVE the costume - you rock it well! I have "antique buddies" that have a shop in Poysippi too - Danny and Myrna (sp?). Hope you can find another place to wear this. What a fantastic witchy costume! I can imagine you would have been swishing about all over the place! I used to love the challenge of creating improvised costumes using various patterns for my girls on Halloween, but as they've grown up I haven't done it for a while. It's never occurred to me that I could play dress up, you look so wonderful!